If it's August, it must be Trans Baviaans month. Usually, the race hangs over my head like a death sentence, but this year was different. I had somehow managed to keep some of the Epic fitness, and with the mild winter had been able to put in some good training. For once, I was looking forward to the race. Our team was the same as last year, but this time with a new name - Rusty TarTrollips. I am beginning to think that choosing a team name is more difficult than actually doing the event. Once again, John wasn't entirely happy with the name, but considering some of his suggestions, I really wasn't that concerned. Our backup crew this year consisted of Bonte - an expert in all things backup related, with a particular talent for making very good tea, and her young apprentice Rowan. Volunteering to do backup involves sitting in a car for 7 hours as we drive to Willowmore, then driving several hours to Jeffery's Bay to offload all the luggage (on a side note - I was very proud of myself - I was able to leave my ammo box of bike goodies behind, and didn't miss it once), before heading off to the first checkpoint where we would meet up with them. And then waiting. Lots. Throw in some grumpy cyclists with strange requirements and you can clearly see that it isn't a holiday at all. I arrived in Hermanus at around lunch time, with chicken livers couriered from Somerset West - chicken liver pasta is John's prerace meal of choice. We suspect the other Hermanus team had tried to sabotage his event by purchasing all the chicken livers in Hermanus. After some mechanical issues involving a bike rack, a computer geek and an estate agent, we were ready to pick up Craig, Bonte and Rowan, and head off to Willowmore. The car trip is a long one, and John passed the time sending tweets to Twitter and updating his Facebook status from his phone. And they call me the computer geek. "Craig just touched me with his smelly toes - must remember to disinfect before bed". "Who put Dane in charge of music - this Kings of Lions is awful! Could be worse - at least it's not Wunderbom!" We had supper (the chicken liver pasta) at the Engen just outside Mosselbay. Diniel had been kind enough to make enough for all of us, but I could see John was a little uncomfortable about sharing his secret prerace meal with us. I just hoped it had the same effect on me - enough legs to keep up with the rest of the Rusty TarTrollips. We got to Willowmore quite late, only to discover that our mattresses in the hostel had been stolen. We suspected the teams in the neighbouring rooms, but when questioned they denied everything. So much for the camaraderie of mountain bikers. And they dare accuse the roadies of being heartless posers! I slept terribly - I had a headache and my pulse was racing. And when I did eventually manage to fall asleep I snored. Apparently. I did wake myself up once through the ear plugs, but thought it was an isolated incident. Apparently not. "Dane is snoring - another minute of this and I am going to stuff a pair of socks down his throat!" With everything packed and ready to go we rode off to the start, and already things were going a little pear shaped. Craig's fork wasn't holding air, and my heart rate was sitting at 120 beats per minute freewheeling down a hill. That was about 25 beats higher than normal. I phoned uber nurse (Yolanda), just to make sure that I didn't have swine flu. I might have left out some of the details, and was really just looking for her to give me the go ahead to ride. There was no way I was going to miss out on my 6th Trans Baviaans! After the traditional prerace mumble from Wikus, we started the 2009 Trans Baviaans race - 230kms lay between us and Jeffery's Bay. What would this year hold for us. John started with a bang and before long Craig and I were scurrying to chase him down as he weaved his way through the field. "Awesome - the pasta worked - time to dish out the pain. Revenge for last year!" Within 10 minutes the Rusty TarTrollips had stopped at the side of the road - Craig had punctured. As we fixed the puncture the entire field came past us, some making pretend offers to help, and others coming up with witty chirps. You never realise how big the race is until all 220 teams have gone past you. "Tubes? Who races on tubes? And there goes the Hermanus team! Arrg!" I gave Craig's punctured tube to the broom wagon/cheese van (the local police were acting as the support vehicle). Once again John vanished up the road, eager to make up places through the back markers as Craig and I tried to follow. Up ahead there was chaos - it looked like there was some obstruction as everyone was slowing and dismounting. After waiting our turn, we discovered that the obstacle was nothing more than a slight dip in the trail. Once on the main road, we were able to speed up, and started moving back up through the field. Once again we had to endure the chirps from the back markers. My heart rate hadn't settled yet, and I knew that this was more than just prerace nerves - something was wrong. I quickly found my spot on the back of the Rusty TarTrollips, hiding from the headwind behind John and Craig - a place I would occupy for the next 11 hours. We made good progress back though the field, in part due to Craig's super fast big wheeled 29er. I have got to get one of those. We caught and passed the the Hermanus team - they wouldn't be a threat this year. We also passed the team that had stolen our mattresses, and since my brain hadn't turned to porridge yet, I got in a good comment - "for a team that slept so well, you sure ride like sh*t!". Craig being Craig did the lion's share of the pace setting, and I was struggling just to hang on. We were flying and before long made checkpoint one - I gulped down some coke, had some Gu's and snacks - hoping that eventually everything would return to normal. We eventually caught up with a large group, and while I was content to hide anonymously at the back with John, Craig went straight to the front. "Craig is on a death wish - if he doesn't kill Dane he is going to kill himself!". Being accustomed to riding on Craig's wheel (I feel safe riding behind Craig) I went to the front and slotted in behind Craig, and for the next two hours that is pretty much how things stayed. Occasionally one or two of the other 20 or so riders in the bunch would come forward to help, but it was always short lived. I really was struggling, and we had barely been going for 4 hours - if our vehicle had been at the next checkpoint I would have gotten into it. I was struggling on the flats, and the hills were yet to begin. On the hills Craig was struggling with his big wheels and gear ratio, which gave me some company at the back. John was flying - I think he got a special chicken liver pasta from Diniel. By now we had made up the time lost for the first puncture, and were about 30 minutes ahead of our previous best time. We got to check point 3, gulped down some coke and had a sosatie and a potato, and set off to scale the big climb up to BergPlaas. Before we even got to the bottom of BergPlaas I got a puncture - a small hole in the side wall of my tyre just above the beading. We bombed it (CO2 cylinder), and hoped the sealant would do the trick. My brain was completely porridge, coherent thought was escaping me, so John took over and helped with the repair work. The stop cost us 12 minutes, thanks to my porridge brain, and a particularly stubborn valve. After the race, John informed me that I should grease my valve - it took me a while to figure out what he was talking about! 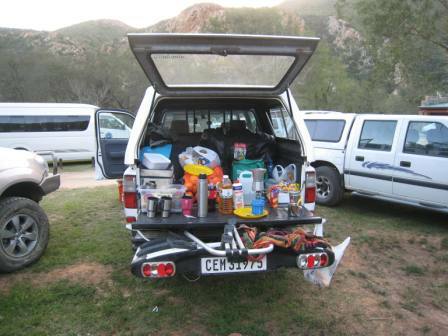 "Craig spotted the Hermanus team - I will kill myself (or Dane) before I let them catch us!". Unfortunately John didn't realise that Craig was just kidding, and rode up BergPlaas like a man possessed, in the process reducing me to a quivering wreck, inches away from hitting the wall. Like 2007, BergPlaas again destroyed me, except this time I didn't have to walk. The only thing that kept me going was the thought of the magic soup and bread they provided at the checkpoint on the top of the climb. It had worked wonders for me in 2007 when John had had to force feed me, and I was hoping it would do the same again this year! We had our soup, applied new botty butter, put on our lights and left BergPlaas in a speedy 10 minutes (Craig was the police man - keeping us focused pointing us in the right direction). "Craig just asked to finish my soup - how rude!" We started the long twisty descent of the pass. This was the earliest we had ever left BergPlaas, so riding down in the light was great. On the way we passed a guy who had a puncture - the course was quite rocky and jutted, and now that I had a tube in the back wheel, I didn't want another puncture so I carefully picked my way down. Upon rounding a corner, I saw Craig lying in a heap, with John almost stopped on top of him. Craig had punctured his front wheel and lost control. He was quite bashed up - his knee and shin the proud new owners of some roasties. We quickly fixed Craig's puncture, and with a little more caution carried on down the pass. We had now used our last tube and would have to survive until the next checkpoint where we would finally meet up with Bonte and Rowan. First class backup services - they win the prize for best seconders! For the first time all day I found myself able to do some work on the front - not because I had finally come right, but because Craig and John were paying for babysitting me all day. I felt quite bad for being the weakest link and was trying to help out as best as I could. After some rolling hills on wide dirt roads we finally made the next checkpoint at Kondomo in the light. I wasn't really that light, with the sun having set quite a while previously, but it still wasn't dark enough for us to use our lights. We really were flying despite all the issues we were having. 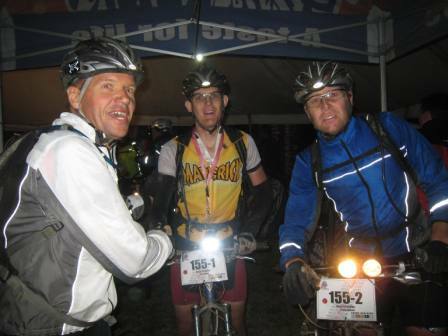 We had left BergPlaas in 29th position (having been 220th at one point). Bonte and Rowan were on hand to tend to our needs - I had a two fantastic cups of tea - easily in my top 10 cups of tea list of all time. 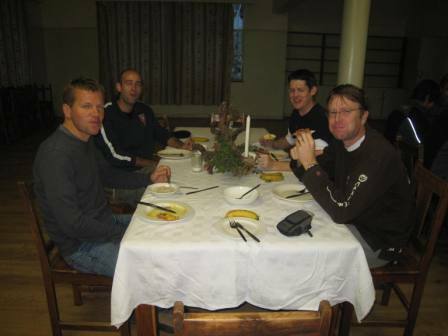 Bonte and Rowan had also organised potatoes and fruit and some other snacks for us, and helped where needed. After a slightly longer stop (Craig the policeman was busy, and with no one to hurry us along we faffed quite a bit). "At least I am not being force fed oranges this year - maybe I should get Dane to have one or two." We left Kondomo in the dark, and had the NeverEnder climb to look forward to. Once again I went to the front, only because it was flat, and on tar, and stayed there for about 5 minutes until we turned of and began the climb. That was the last time I would see the front. The nice thing about racing at night is that you can see the teams ahead of you from their flashy red lights. Targets! We had decided to ride in stealth mode, and had no flashy red lights (we actually just forgot about them). John was chomping at the bit and set a good pace up the climb, and before long we had caught and passed the first target. We passed several other teams, leaving them behind us, until we got to a team that decided to hook on and ride with us. Slowly but surely John and Craig started upping the pace, as well as my level of discomfort, and before long I was spat out the back of the group. I dangled there for a while, while John and Craig did battle with the other teams on their wheels. Eventually the gap was so big that I had to call out and ruin their fun. As they sat up, so did the other teams, and when I caught them we easily rode away from them. Why hadn't we tried this strategy several kilometers earlier? Despite my slowness, we were still making good time and reached the final checkpoint in 26th position (having lost several positions at the last stop). "Now he wants my Enerjellies - can you believe Craig's cheek!" We had to pump up Craig's wheel, and I took the opportunity to sit down and catch my breath, and have another cup of superb tea. I force fed my self just enough snacks to make the last 30 kilometers or so, and we were off. Several teams had decided not to stop at this checkpoint, and once again we had to catch and pass teams. Suprisingly, we did most of our passing on the hills - at least I wasn't the only one finding them tough. After a short climb we eventually emerged on the top of a small rise with the lights of Jeffery's Bay waiting for us in the distance. John didn't need any encouragement, and took up the pace making duties, Craig and I tucked in behind him. A big bunch of riders caught us, and John quickly hopped on the back. Craig and I took our time as we struggled to hook on but we did it. We turned on the N2, on to beloved tar, and the pace immediately picked up. White line fever was gripping every one. Up a small rise John gave me a push to stay in contact with the bunch, and I wondered why it had taken him 228kms before deciding to push me ;) Having made the mistake of turning down the wrong road to the finish line in the past, I had made sure I knew where to go. Unfortunately, the same can not be said for the rest of the bunch as everyone except Craig and I took the wrong turn - including John. Suddenly we were in with a chance of beating 3 or 4 teams, so Craig and I kept going, knowing that John was strong enough to catch us. After a slight mishap 30m from the finish line we all crossed together - in 20th place, in a time of 11:10:21. Finished - physically and mentally. Number 6 was over, and I have never been so grateful to get to the finish. I really thought I was going to die somewhere along the way. My average heart rate, sitting on the back and not doing any meaningful work for 230kms was 157 beats per minute. We headed back to our accommodation for the night, cleaned ourselves up, had lots to eat, and chatted about the race. Bonte produced another delicious cup of tea, and we all headed off to bed. "Awoke to find Dane staring at me - freaky stuff! I shouldn't have accused him of snoring last night." The long drive home was hell, but the time passed quite quickly, and before long, the Trans Baviaans weekend for 2009 was over, but certainly won't be forgotten.